Your puppy dog is a beast! Just think about it and you might realize that he's a lot more like a Wampa from Star Wars than you originally thought. The way he gobbles down his food might remind you of the kind of voracity that one would expect from a Hoth creature that hasn't eaten for weeks. The way he protects his home by barking at the mail carrier is reminiscent of how a Wampa would protect his snow cave from Rebel soldiers who wandered to far away from Echo Base. And sometimes his breath probably smells like he's been eating some old tauntaun meat for lunch. Of course, you love him with all your heart despite his beast-like qualities, but maybe it's about time for him to look even more like the Star Wars creature that he acts like! That's right! It's time to turn your pooch into a REAL Wampa! 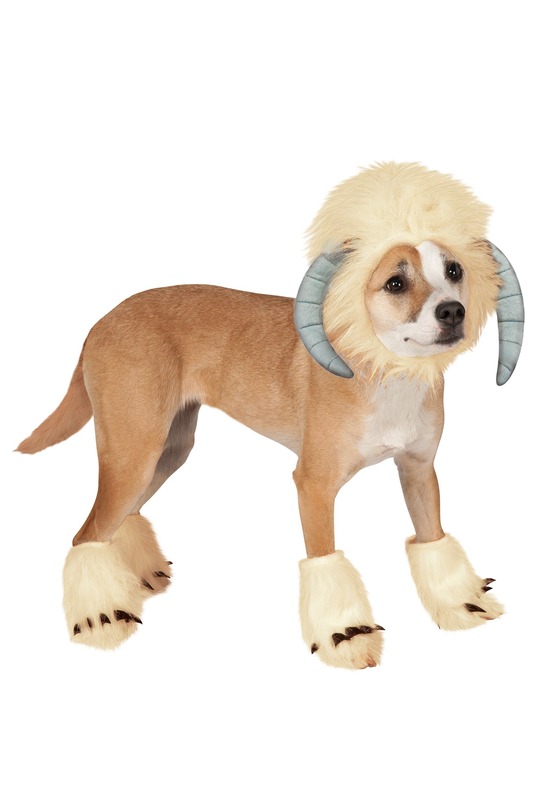 This fully licensed Star Wars Wampa Pet Costume comes with everything you need to get your puppy looking like the creature from The Empire Strikes Back. The headpiece grants him a marvelous set of horns, which will help him intimidate his prey, like tauntauns or that pesky squirrel in the backyard. The fluffy foot covers will help him traverse the icy cold tundras of Hoth and help him look just plain adorable. Just make sure Luke isn't around your doggy, since your pup might get a little too in-character and try to drag him back to his ice cave!